I used to consider myself a burger freak. I was never too adventurous though, and usually stuck with a simple cheeseburger topped with red onion, pickles, and spicy mustard on each individual bite. Beef patties have evolved and it’s about time I ketchup (mu-ahaha) and experience all that burgers have to offer. I’ve complied a list of well known burger joints in the Boston area and hope to slowly but surely devour turkey burger after salmon burger after black bean burger after … you get the idea. My first time at Grass Fed I was a bit overwhelmed. There are not an overwhelming list of options but each one sounded so good I wasn’t sure what to do. 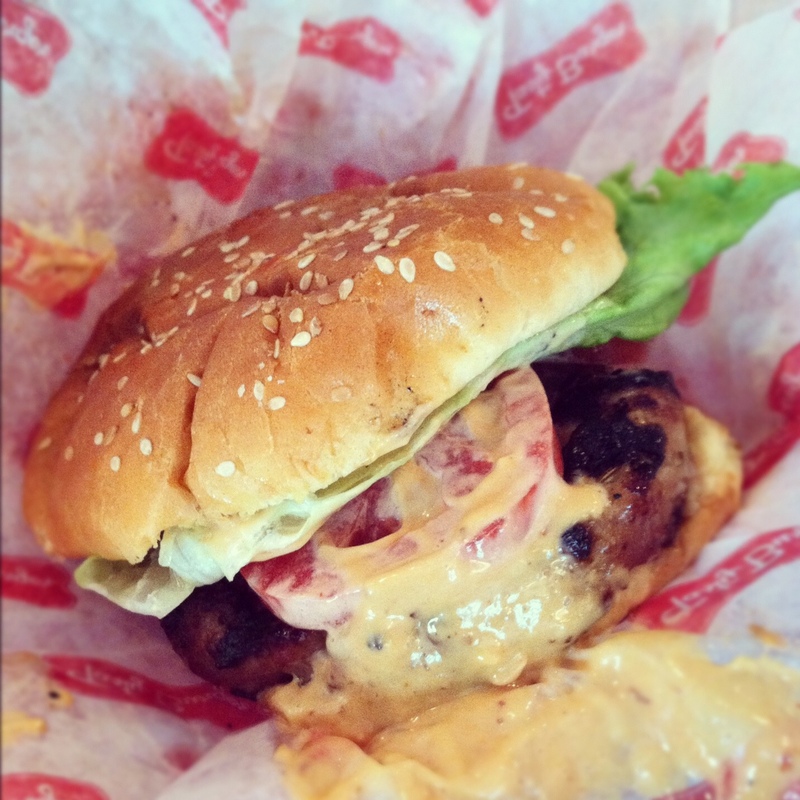 Any of their burger creations can be done with a beef, chicken, or veggie patty. So did I want the Cali Burger made with chicken, the Italian Stallion (chicken, mozz, pesto), or a classic black bean veggie burger? Avocado typically wins me over so I went with the Chicken Cali, and I was not disappointed with my decision. I was also pretty happy that I was with 2 of my friends who were willing to split 3 different kinds of fries: Beet, Truffle-Parm, and Spicy. 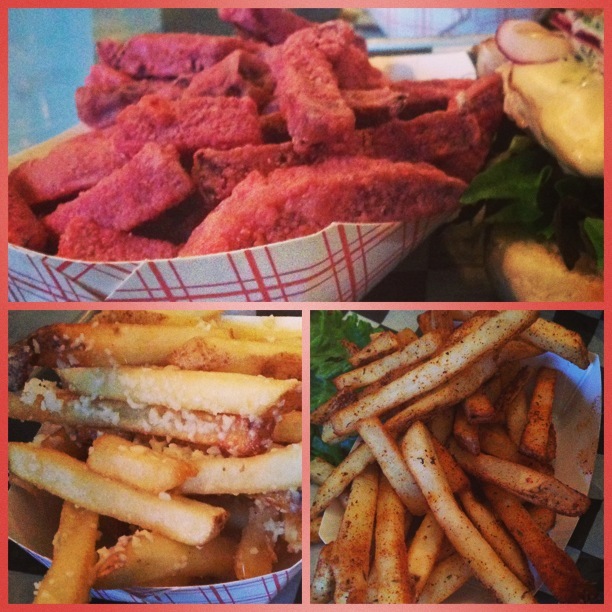 Beet fries sounds odd at first but they were by far my favorite. They’re mainly beet with a thin “fry” crisp, so you feel like you’re eating healthy. The Truffle-Parm fries were good, but I’ve had better (mainly because I prefer a thin cut fry). Unfortunately the Spicy fries did not do it for me. Too much cayenne pepper! The overwhelming smell of the spice was off-putting, nevermind the taste. Oh well, 2 out of 3 ain’t bad! As I am an employee of Mistral, I had the pleasure of being treated to their Prime Sirloin Burger while working last night. 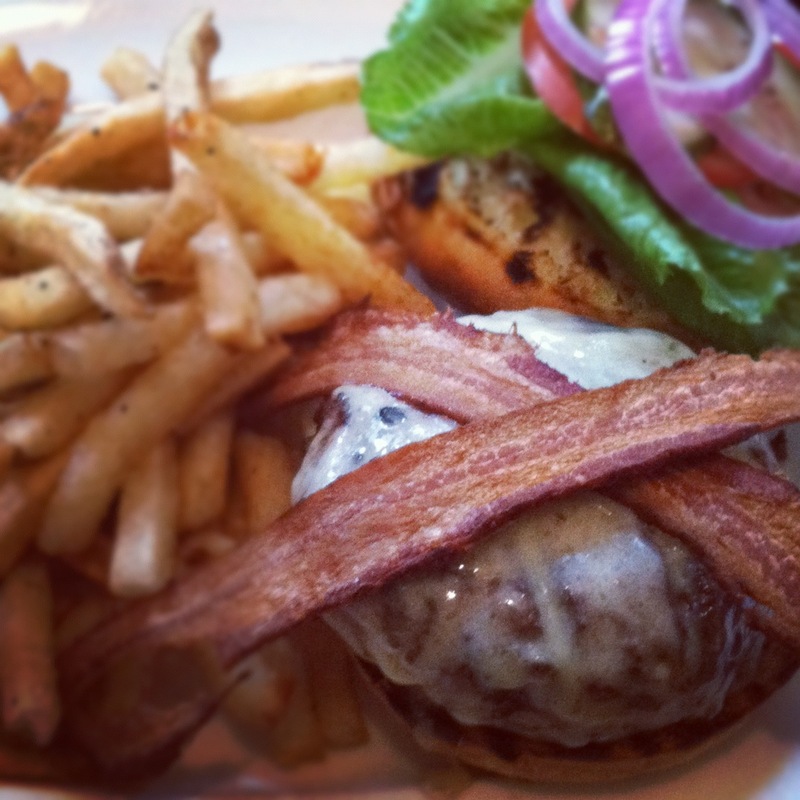 A thin layer of Gruyere cheese is melted over all sides of the plump burger and topped with 2 slices of applewood smoked bacon. Sliced red onion, tomato, romaine, and fries come on the side. I typically ask for my burgers to be done medium but I left this decision up to the chef this time and it came out cooked to perfection, a juicy medium rare. I asked for mustard to top it off and was presented with whole grain and Dijon mustard, my favorites! The best part may have been the brioche bun that was slightly grilled yet still soft on top. 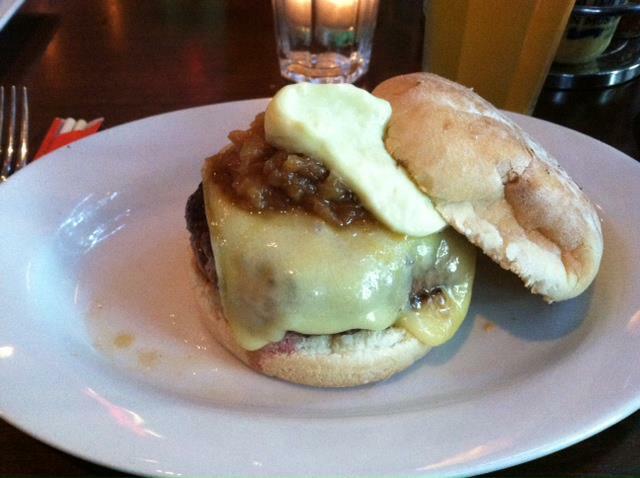 Mistral may not be known for their burgers but this one certainly holds a flame to any burger joint in town. Thanks again Chef Mitch! Boston Burger Company is fairly new to Boston, with it’s original location having opened in Davis Sq. back in April 2009. Since I moved out of Davis in Sept. 2008 I missed many of the now popular eateries that have been popping up. It’s a shame I haven’t visited Boston Burger Co. until now b/c this burger may be the best so far. For most of this battle I’ve been trying turkey and veggie burgers, and I couldn’t be happier I choose this beef burger today. Thick provolone was melted over the entire patty, the pesto mayo was generously spread on the top bun, and those marinated chopped tomatoes provided just enough extra juice and flavor. This was a big, excellent, filling burger (hours & hours later I still wasn’t hungry for dinner). 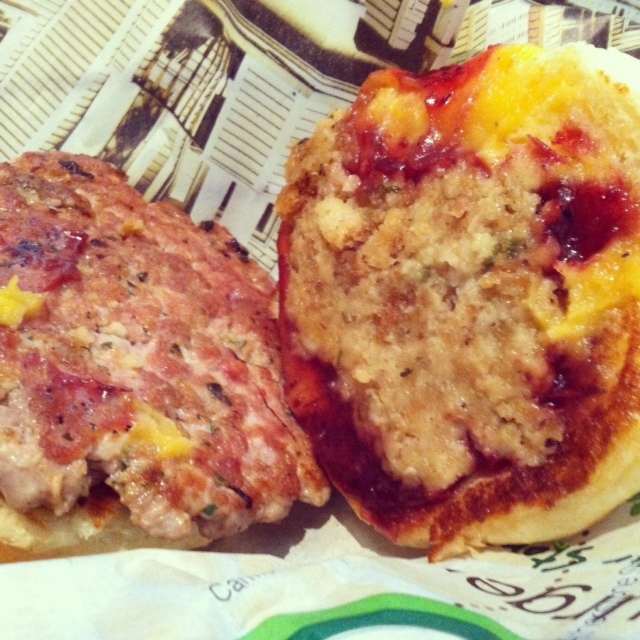 Matt’s Pilgrim (turkey) Burger was just as packed full of goodness with cranberry mayo, stuffing, and American cheese (sorry Wahlburgers, but it surpasses your Thanksgiving Burger by far). 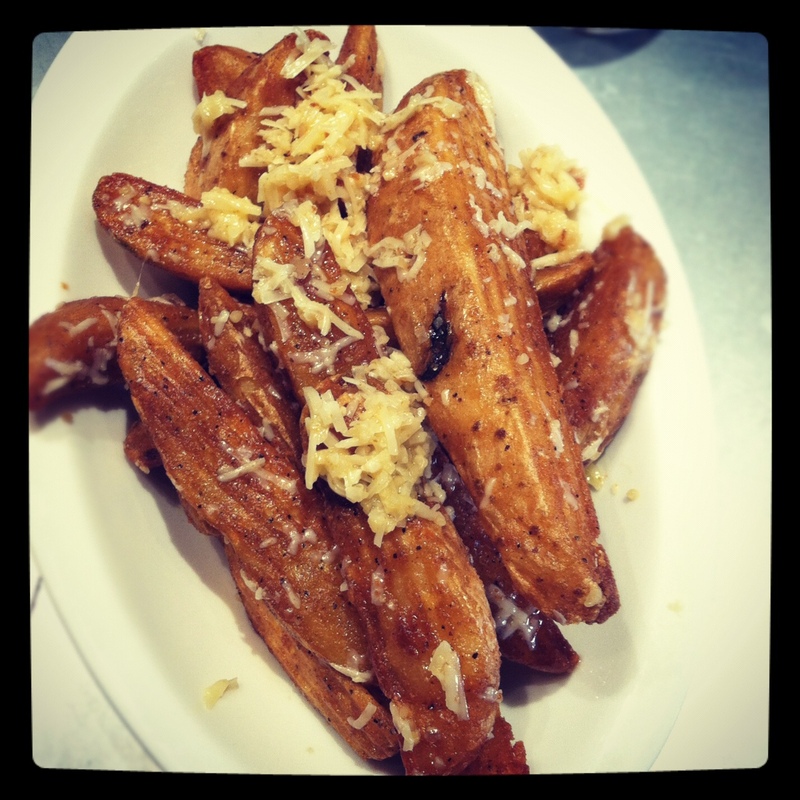 We also felt we needed to try one of the many frie options and went with the Garlic Parm. The wedges came topped with shredded parmesan cheese and sat in a small pool of excess oil. They were really tasty but I prefer skinny, less greasy fries (and I hear the Sweet Potato Fries are just that). We sat at the bar and watched as our server made milkshake after milkshake, and after tasting a small sample Matt decided he needed to walk out with an Oreo Shake. 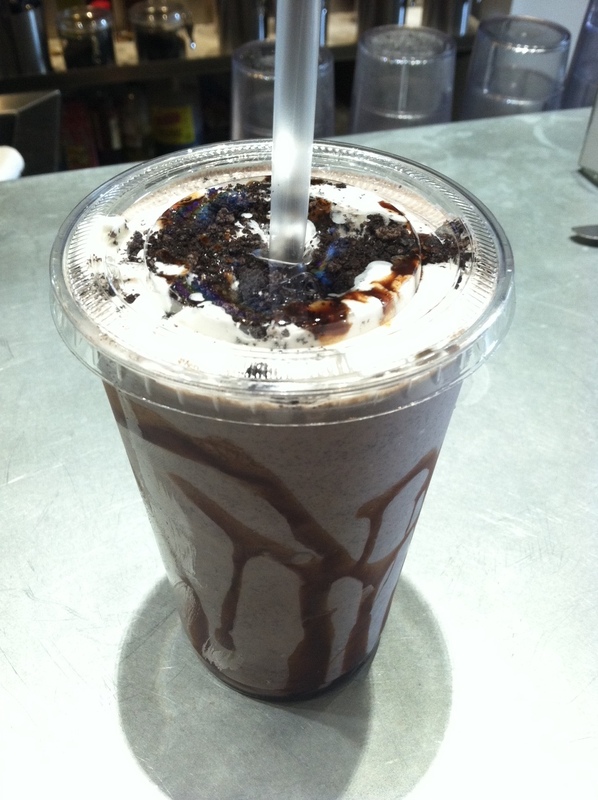 I was able to steal a few sips and it was pretty incredible. If you’re looking for a serious burger I suggest trying Boston Burger Co. for any of their 28 outrageous Specialty Burgers. 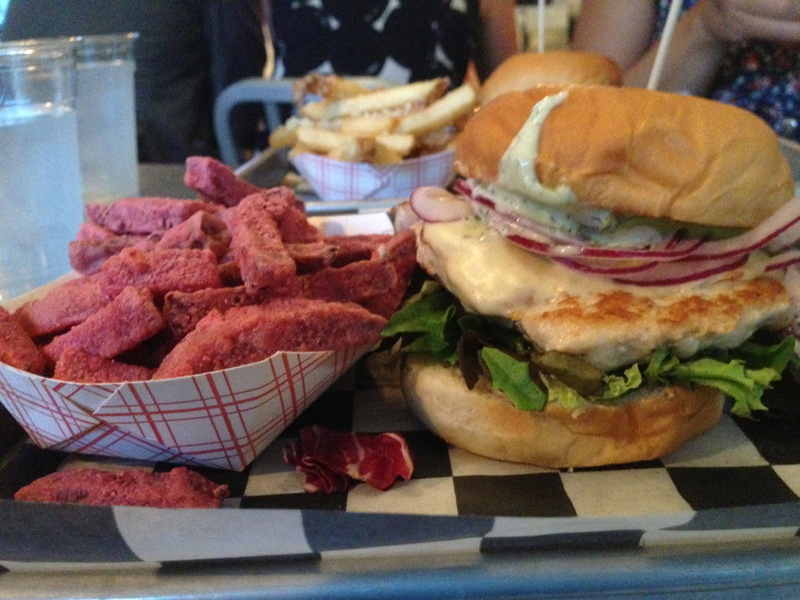 If those are too intense for you (check out The Kitchen Sink burger), there’s always the option to design your own! 5 Napkin offers almost every type of burger I’ve seen out there: beef, turkey, inside out (wrapped in lettuce), veggie, tuna, and lamb. Apparently I was feeling boring on this particular day and ordered the least exciting burger on the menu. Well, it may have seemed simple compared to the others but it packed flavor and depth. This thick patty came with melted gruyere cheese cascading over the side of the burger, topped with a pile of caramelized onions and a big scoop of rosemary aioli. After scrapping off a bit of the mayo, I bit into my medium burger and loved every bit of it. It’s the first hamburger I’ve had in this battle and it was a great one to start with. 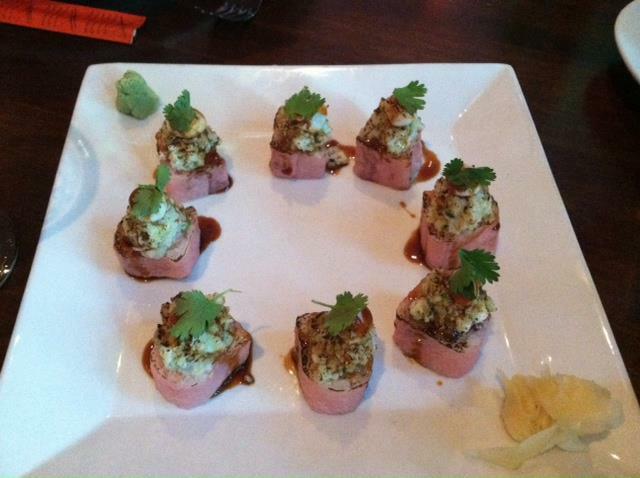 I suggest 5 Napkin not only for their burgers, but also surprisingly enough for their sushi! We ordered the Sushi Special (spicy tuna, avocado, king crab salad, torched scallop, sriracha chili sauce, eel sauce, cilantro) and were blown away. 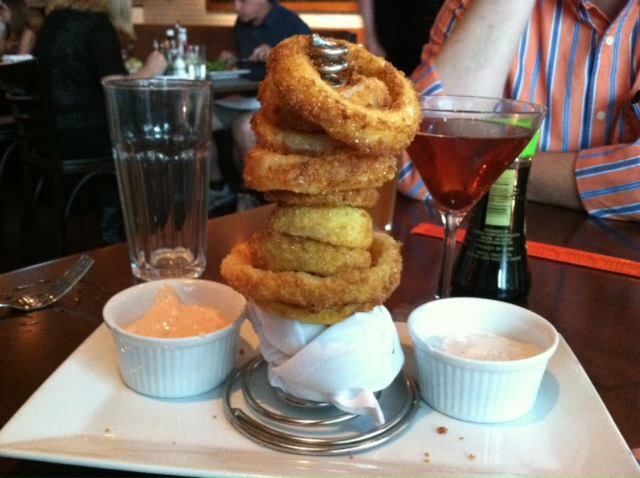 The onion rings were also top notch. Next time I’m looking forward to trying the Lamb Kofta Burger (chopped tomato, cucumber, pepper & onion salad, tahini sauce, soft white roll). Entering Wahlburgers for the first time requires some much needed direction. An employee made us aware of the 3 dining options: to the left is full service sit-down dining, straight ahead is bar seating with 6 flat screens overhead, and to the right is cafeteria style where you order at the counter and find your own seat/booth. We opted for the latter as every table was full except for 2 seats opening up to the right. I had my mind set on my lunch option and went with the Thanksgiving Burger with Sweet Potato Tots. 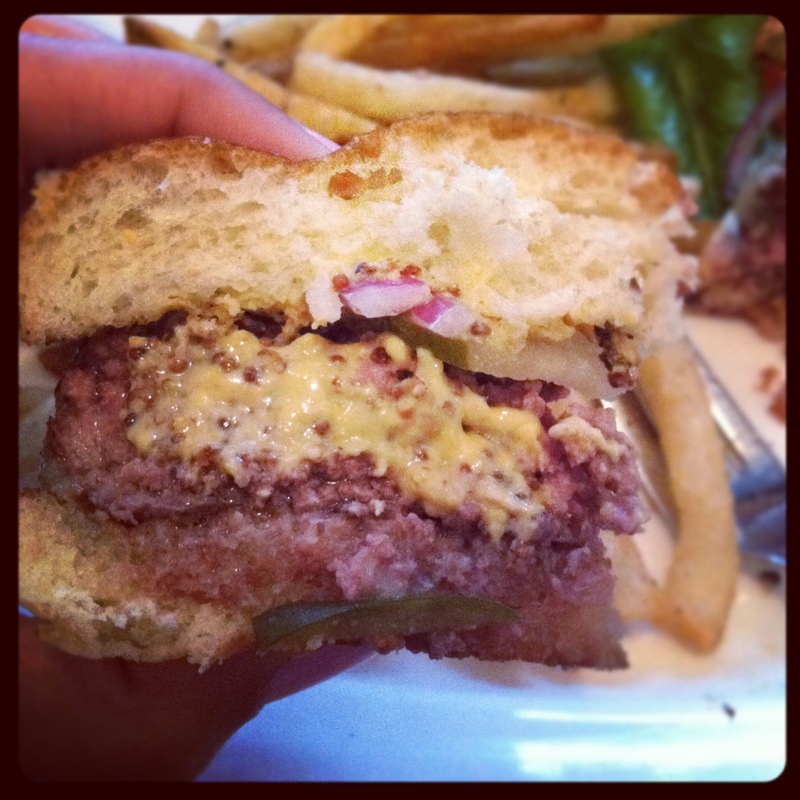 The condiments really made this burger what it was… delicious! Although, if this turkey burger were to stand alone I don’t think it compares to the fennel-infused seasoning of Tasty Burger‘s turkey option. The tots were fantastic, slightly crispy & smooth on the inside, and the chocolate-strawberry frappe we ordered to go was really tasty. I was pleased with their Specialty Burgers, add ons, homemade sauces, and overall atmosphere, but was disappointed that the only veggie option was a Portobello Mushroom Cap Burger. 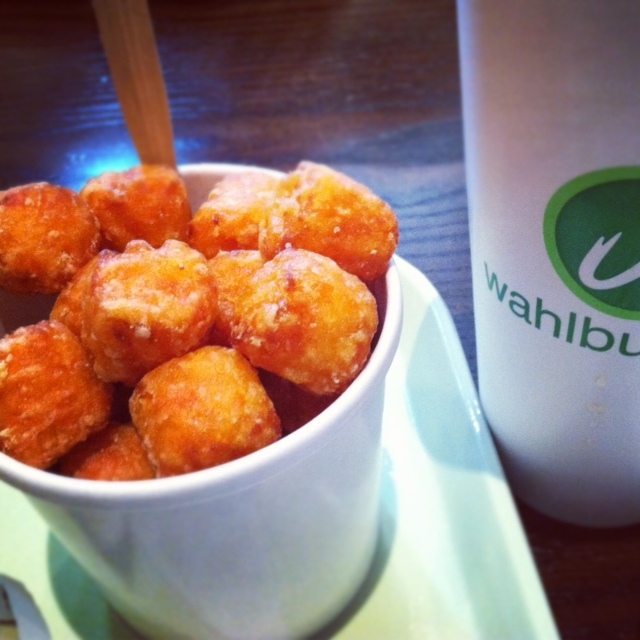 As that was the only let down, I do think Wahlburger‘s was worth the 30+ min drive from Boston. Take the trip and see what it’s all about! As you can imagine, there are 4 burger types to choose from at FOUR Burgers: beef, black bean, turkey, and salmon. They also have a #5 special at each location and today’s in Boston was the Lamb Burber topped with cucumber-feta salad. While they do suggest certain add-ons with each burger option, it’s more of a “build your own” mentality with a variety of buns, cheeses, toppings, and sides to choose from. I went with the organic vegan black bean on a whole wheat bun topped with pepper jack cheese and guacamole, with a side of sweet potato fries. 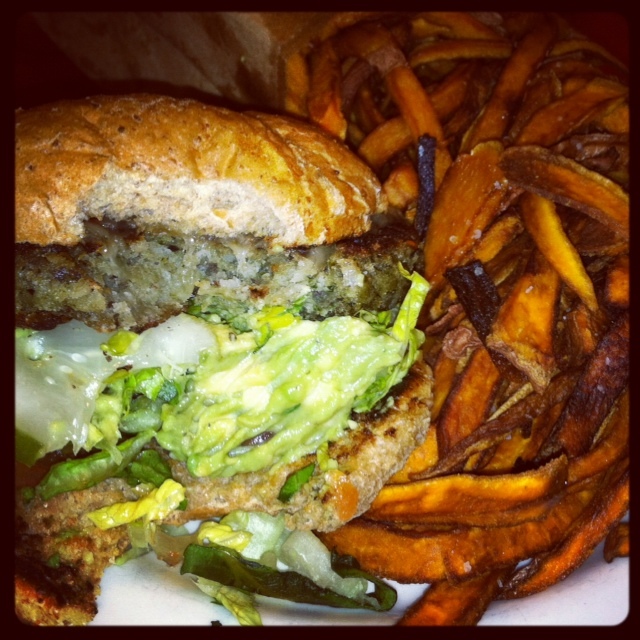 The veggie burger was moist, soft, and quite filling! Everything comes in jumbo sizes as the fries could have fed at least 3 people. Sweet potato fries are hard to master, and these weren’t bad – sliced thin and sprinkled with a little salt. Four Burgers also serves up hot dogs, beer & wine, 3.5oz mini burgers, and a kids menu option. I’m looking forward to returning for a beef or lamb burger! I’ve been hearing about Tasty Burger for a while now, that it’s the best in town, the “In-N-Out” of the East Coast. The menu is certainly tempting with a variety of specialty ham/cheeseburgers, a turkey & a veggie burger option, chicken sandwiches, hot dogs, salads and sides. Most of the hamburgers seemed a bit overwhelming for me except the Big Kahuna (pineapple, grilled red onion, teriyaki sauce) which I’ll have to try next time. Today I let condiments dictate my decision and was drawn in by the chipotle mayo. 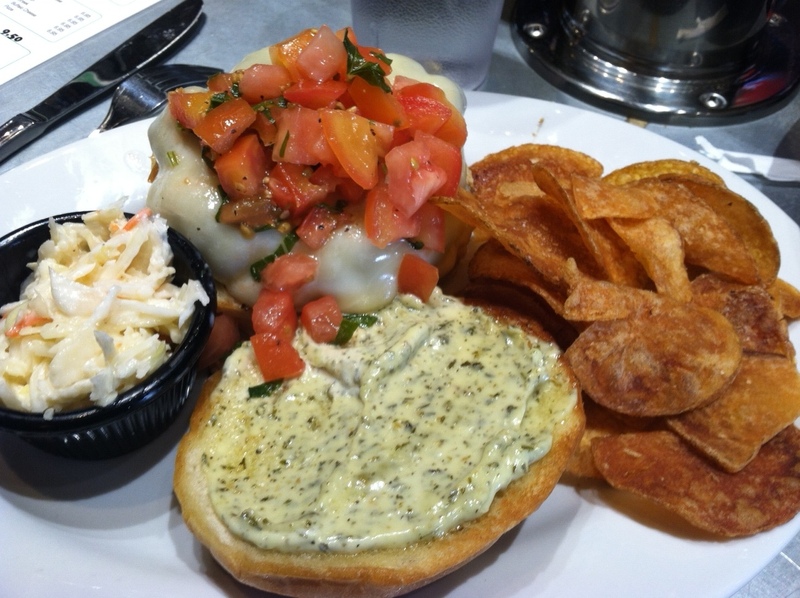 The turkey burger was a perfect portion, topped with lettuce, tomato, and just the right amount of mayo. Simple but hearty, I was certainly full after this meal, especially after the side of Hummus, Guacamole, and Chips. My only criticism is their lack of cheese options (only American and Swiss), but I am impressed with their wine & beer selections. Overall, I highly suggest Tasty Burger, but beware… these burgers mean business. 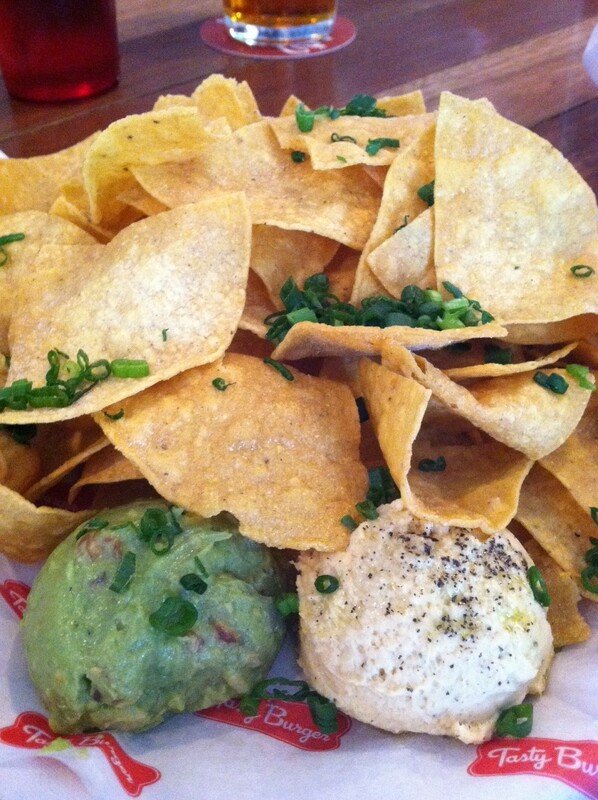 I adore B Street and would love to try the burger! I know you don’t take reservations; when would be a good evening to come in?